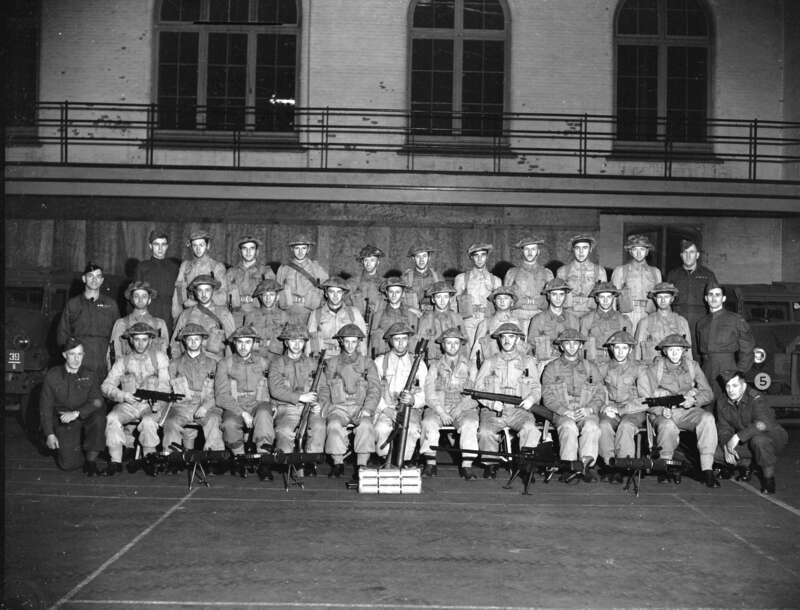 A photo from the City of Vancouver Archives showing the Reising SMG being used by a canadian unit of the west coast. Interesting, the WO on the right end has the early style regiment slip ons and the Boys AT rifle and Lewis guns and the Ross? would indicate an early 1940's picture. I can't see the Boys rifle indicating 1940. The Boys is the later mk1*, with the flat muzzle brake and the late bipod. The Boys rifle continued in use through to at least 1943, when the PIAT came out. Canada commissioned the Disney Cartoon series "Stop that tank" on the boys rifles in 42. They were certainly involved in the Dieppe raid, and I talked to one naval guy who said they used them on the ships on D-Day to shoot any visible mines in the water. Mind you, I have never found any official verification for that story.